Digital security experts Alan Crowetz from Infostream and Diego Samuilov from Nordis Direct answer your questions. Cindy... that's the kind of question computer people love to vigorously debate. Some would say yes but there are those that would disagree. Ok thank you. You're the best Alan. Thank you Cindy! Greatly appreciated!! Seeking, that can happen if someone is "spoofing the phone number" that is making someone's phone appear to come from a different number. So, EWallet Go! Stores passwords locally on the phone or Ipad and KeepassPassword Safe is to store these locally on a PC? It's not just YOU... .keep an eye on your kids when you are online. Ro, those are 2 examples yes. A bird in the hand is a lost password David! Sad but true Sharon... they can harvest increadible amounts of data with very little consequences. 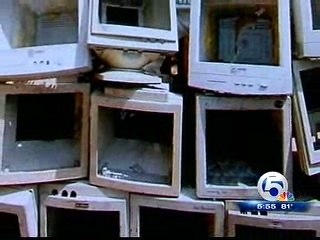 WPTVExperts show you how to erase your old hard drive so your computer stays out of a thief's hands when you recycle it. Ok this sounds crazy, but before we discard our old computers, we take out the hard drive and smash it with a hammer. There's no way to get info out of that hard drive, is there? How is that done? does it come from overseas? or is in in the usa. Can the fcc track that and stop it. Hi Alan and David! Thank you for your advice. Throughout the years at the lab at RA, I learned so much from you. It's good to see you again..even if it is online! Thank you again..Jane formerly of the lab at RA. Hi Jane! Glad you like the information! Sharing tips and information is what we love to do! Ro, physical destruction of the hard drive will prevent thieves from getting that data. What is the free military grade destruction of the hard drive? Where do you find that? How safe are pubilc wifi (such as Macdonalds)? Safe enough for doing emails? Safe enough for doing personal banking? how do you know if aprogram like passwordbox or the site you download it from is safe? I have an IPhone it won't allow me to shut off the Gps. What can I do!